Date/Time: Tuesday, May 21st 2019, 6.30pm. Location: St. Ignatius College Prep. It’s our favorite time of the year! Please join us as we welcome the new HEAR Class of 2023 to the family. We will be awarding up to 30 new scholarships this year and we hope you can join us and celebrate these outstanding young scholars. Date/Time: Saturday, December 7th 2019. Location: The Hilton Orrington, Evanston. Mark your calendars! The date for our annual fundraiser is set. This year’s event is sure to be better than ever as we review the success of the HEAR Foundation and celebrate reaching 100 scholarships! 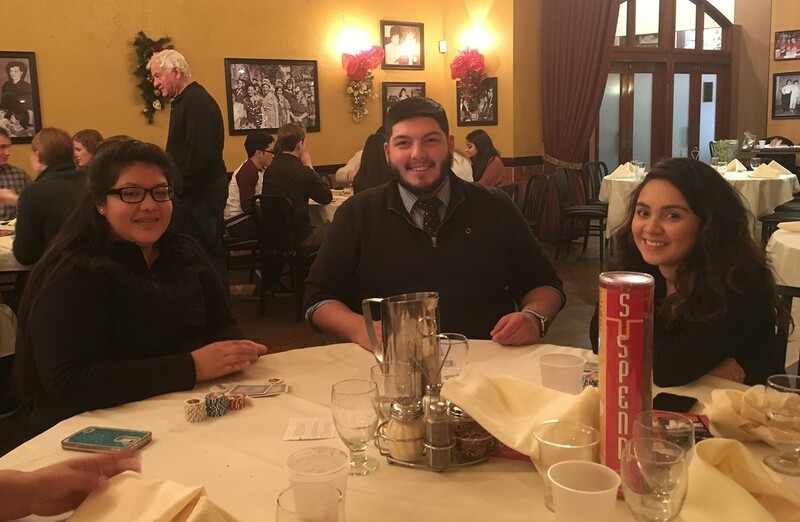 In late December, the HEAR Family of Scholars came together for our annual Winter Social at Pompei Pizza in Little Italy. We love this event for many reasons, not the least of which is that we get to reflect upon a full year with our scholars. 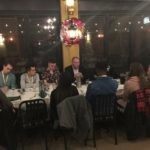 Our Freshmen in particular have had life-changing experiences, and we were thrilled to have an opportunity to share a meal, listen, and learn. Along with several of our staff and directors, this year HEAR also welcomed two special guests: Dr. Terri Thorkildsen from the College of Education at the University at Illinois at Chicago, and Jerrold Rumps, Outplacement Specialist and Career Transition Strategist with Challenger, Gray and Christmas. Professor Thorkildsen met with the Freshmen for a very lively Q&A on their first college year. Our Sophomores, Juniors, and Seniors were able to gain invaluable insights from Mr. Rumps about what is now uppermost on many of their minds: resume building and job searches, the right internship, a good interview strategy, and how to combat the jitters. Our scholars asked great questions and made excellent use of this unique opportunity. A big thank you again to Jerome and Terri for becoming part of the HEAR Family! 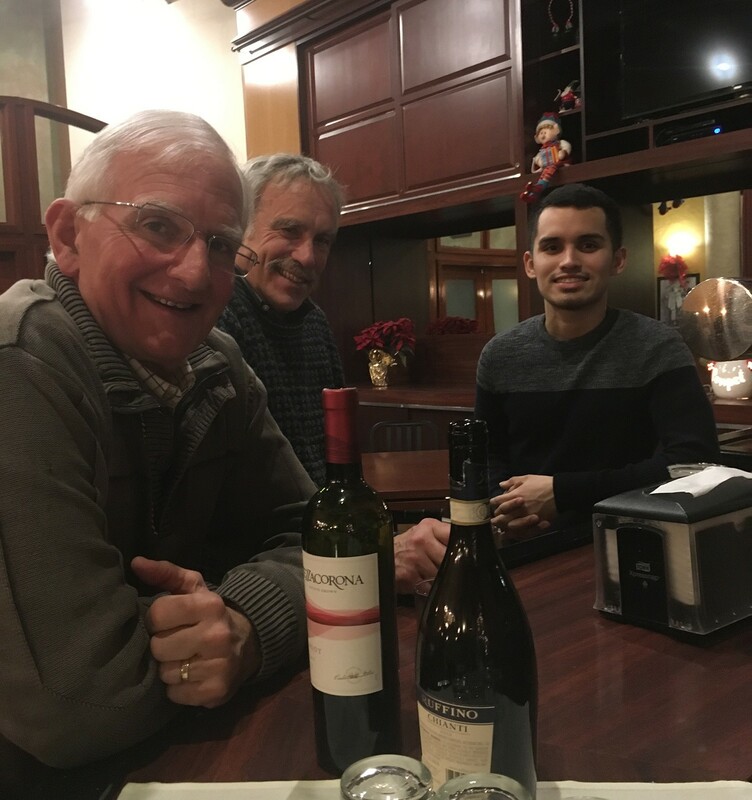 HEAR Directors joined the scholars for pizza and dessert and some necessary shop talk. They were able to find out directly from the scholars what their needs and concerns are, and in what ways we can help – be that with guidance and advice, contacts for internships, or specific expertise in a field of interest. Events like these allow our scholars to build the networks that they need to be successful. If you want to be part of it, please do not hesitate to contact us! – sharing opportunities and expertise from your industry with us. or give us a call at 847.834.9124 to find out how. Join HEAR and be the change! 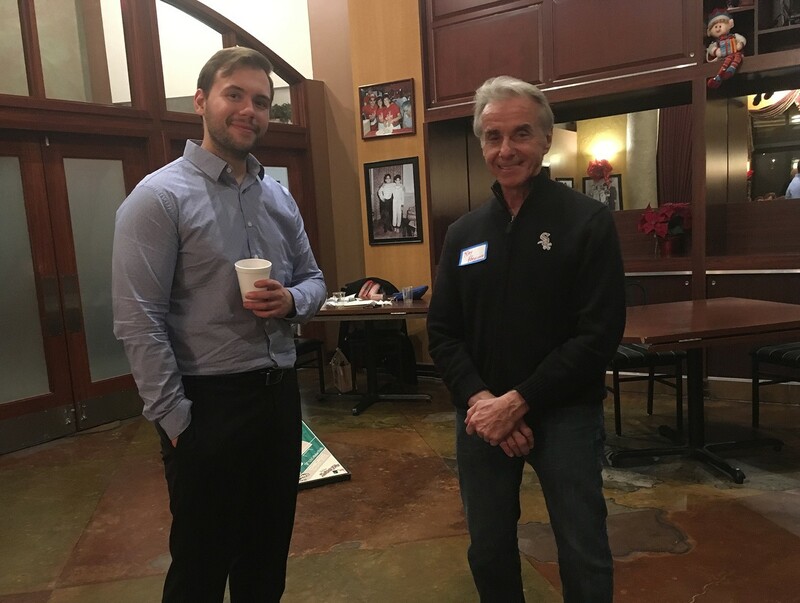 Our 2018 Holiday Fundraiser Was A Great Success! 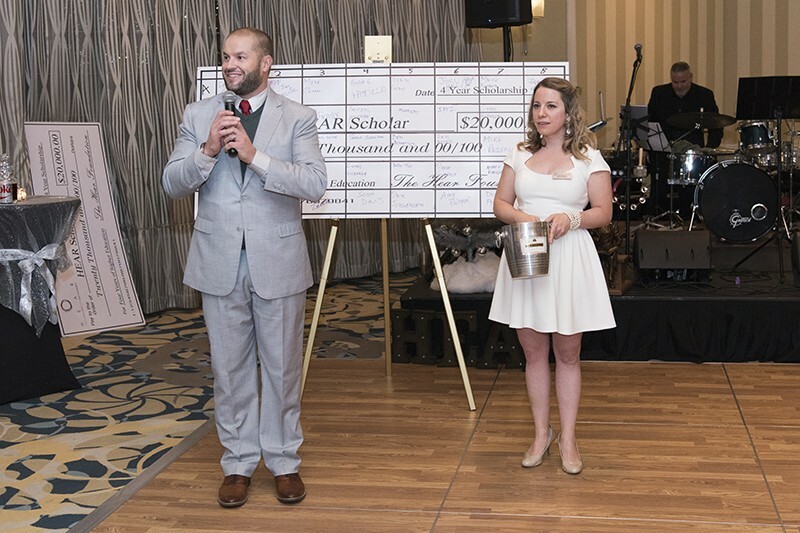 The annual HEAR Fundraiser was the highlight of our year! 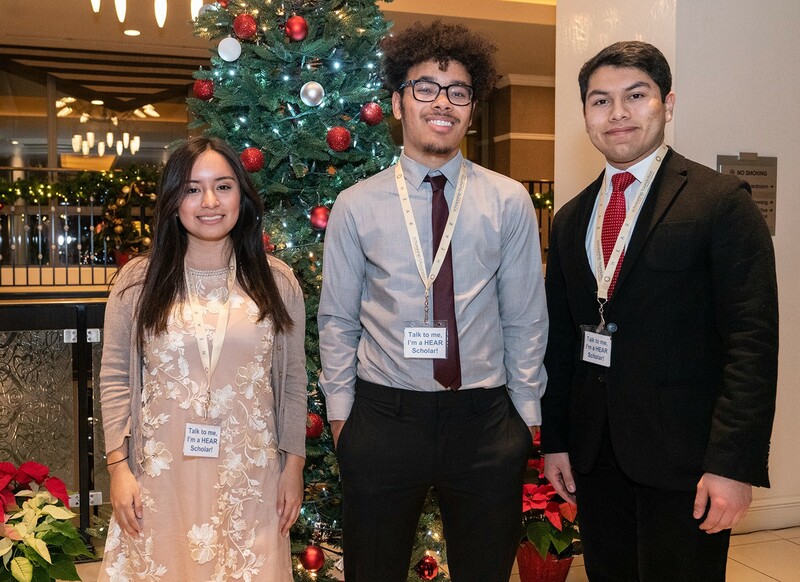 On Saturday, December 8th, over 200 guests helped us celebrate our most successful year to date as a Foundation helping financially disadvantaged, exemplary high school seniors fulfill their dream of a higher education. 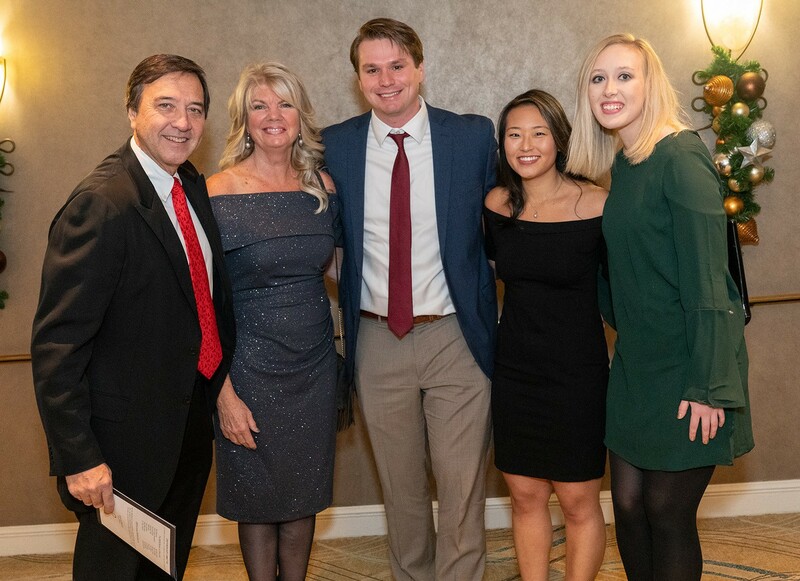 A fantastic silent auction, sold out scholarship square board, great food and wonderful band ensured the event was a resounding success and a great way to help our scholarship funding for 2019. A full photo album will be available soon, but we wanted to share a few shots with you now! A HUGE thank you to everyone involved in ensuring our party was one of the best in the Chicagoland area! 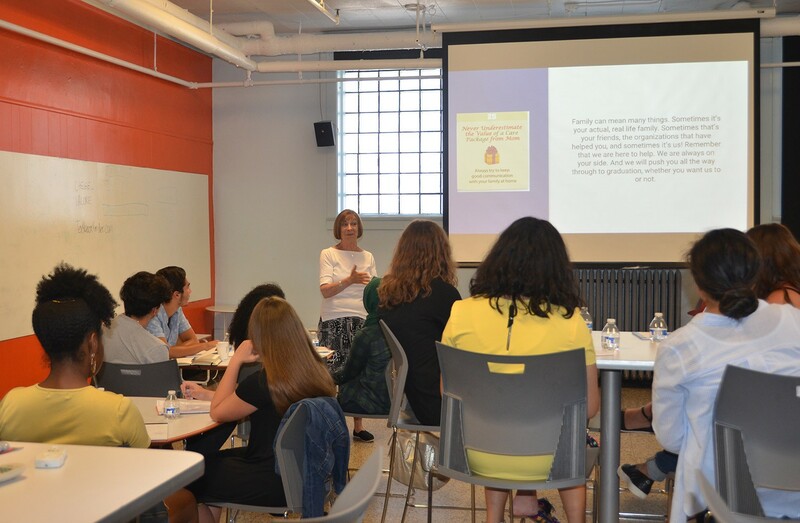 Sunday, July 8th 1018 was our annual HEAR Summer Scholar Event and we were fortunate to be able to hold it at the Chicago Academy for the Arts who very kindly let us use their space. The main focus this year was on our newest, and largest, class of HEAR Scholars. 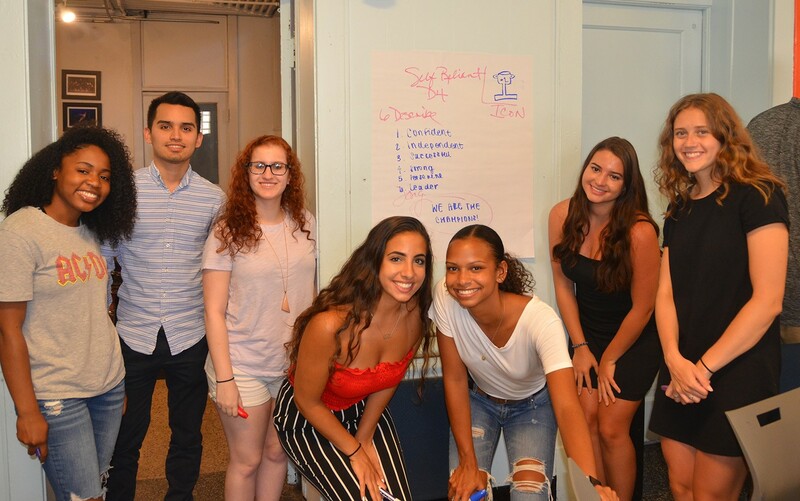 In the fall, 27 new scholars will be heading off to college and, given that many of them are first-generation college goers with no one to turn to for help and advice, we wanted to ensure that they are as prepared as possible. 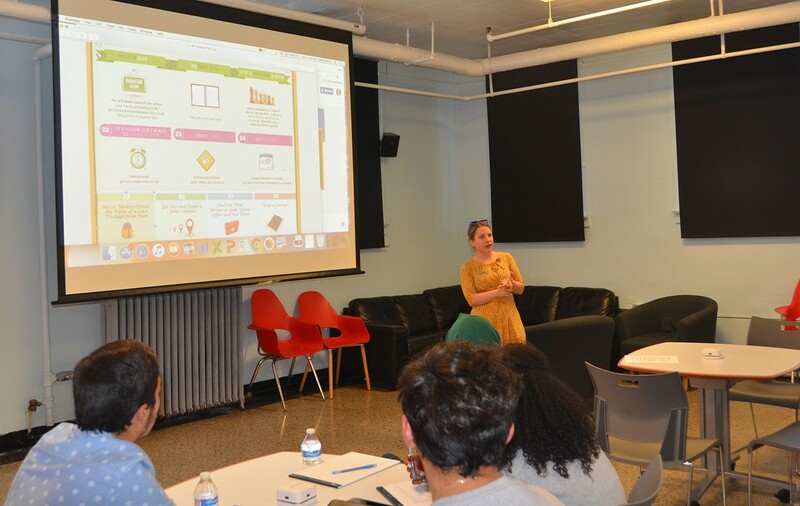 Vera Pollina (HEAR’s Executive Director) gave an informative presentation with many pieces of advice on how best to get a head-start at college and to set goals to work toward. Tips included getting to know your teaching assistant, always attending class, creating and sticking to a budget, finding & using school resources (fitness centers, health clinics, dining halls, writing centers, tech support centers, counseling centers), learning how to schedule, early class registration, practicing professionalism and much more. We were very grateful to have HEAR Volunteers participate; Mary Sue Smith, chair of our HEAR Enrichment Committee, gave each scholar their first HEAR Care Package, explaining what was in the box and what it signified. She also shared a few thoughts about keeping healthy. 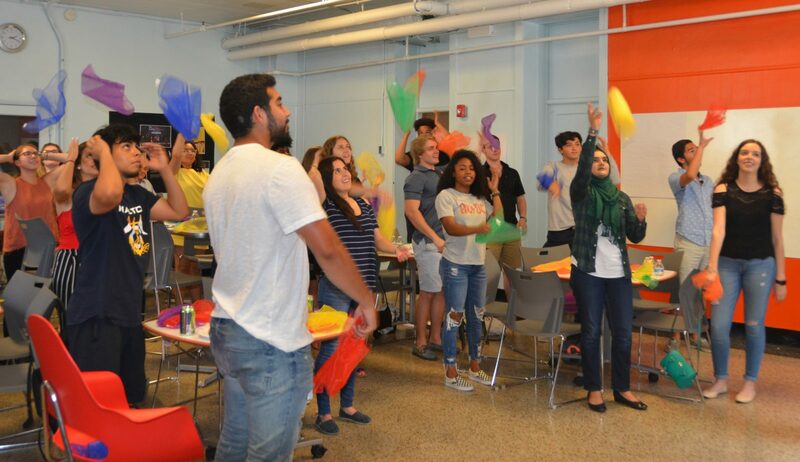 Lynn McCreery, an expert in the field of training and facilitation, conducted a very popular change and leadership workshop that was not only very informative, but also interactive and fun! Finally, a number of current and graduated HEAR Scholars attended, sharing their experiences and providing another opportunity for our new class to ask questions before they embark on their college journey. Our Annual Awards Ceremony Was Inspiring! 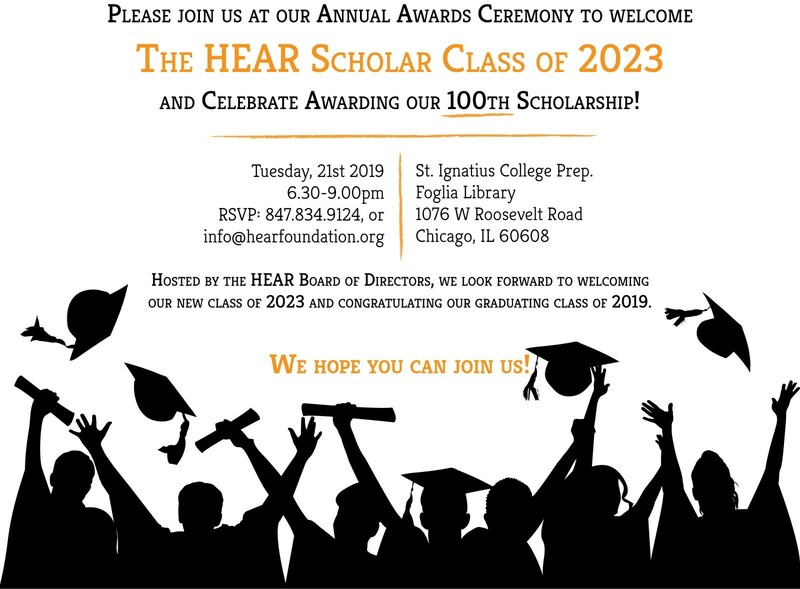 On May 8th, The HEAR Foundation was delighted to announce our new HEAR Class of 2022 at our annual awards ceremony at St. Ignatius College Prep. in Chicago. Thank you to John Chandler, Vice President at St. Ignatius, for allowing us once again to use the beautiful Foglia library (and courtyard) for our celebration. We were delighted to welcome Dr. Toinette McClellan Gunn, Vice President of Programs at Chicago Scholars, as our keynote speaker. Her speech resonated with all of our scholars, and many others in our audience, as she described the challenges she faced in pursuit of her own academic career. This year, thanks to the continued generosity of our donors and supporters, we were able to offer 25 scholarships – our biggest class yet. 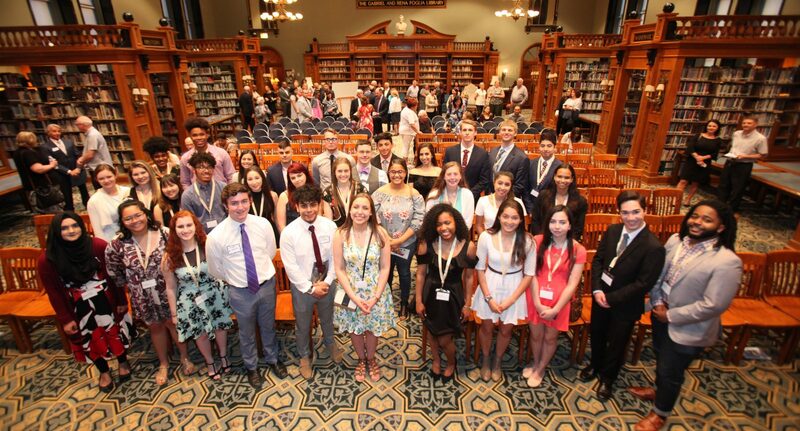 We look forward to watching these exemplary Chicagoland students succeed in their own college journeys, and we will be there to help them every step of the way. We also celebrated the perseverance and determination of our HEAR Class of 2018 as they prepare to graduate from their respective colleges and look towards their futures as college graduates. 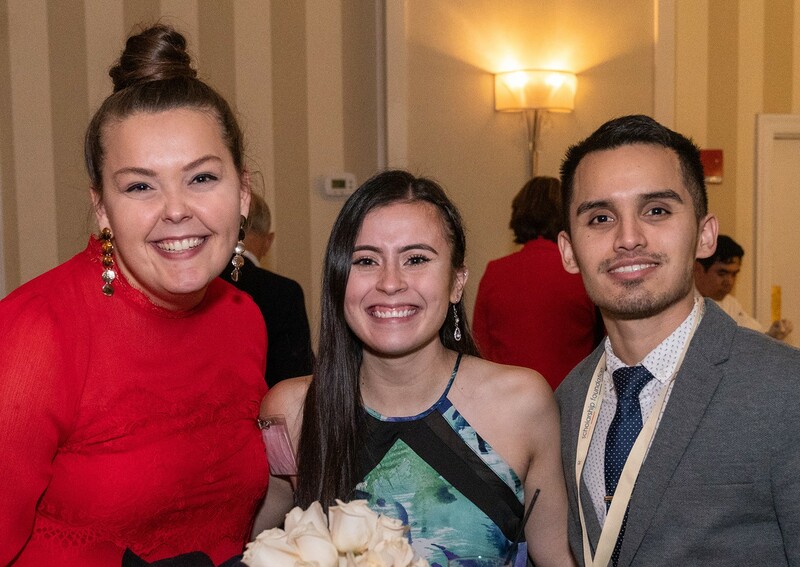 We look forward to sharing details of our annual winter social – a popular event with our scholars who use the opportunity to catch up with other HEAR Scholars, mentors and HEAR Staff. Check back soon for more details! The 11th Annual HEAR Fundraiser Was So Much Fun! 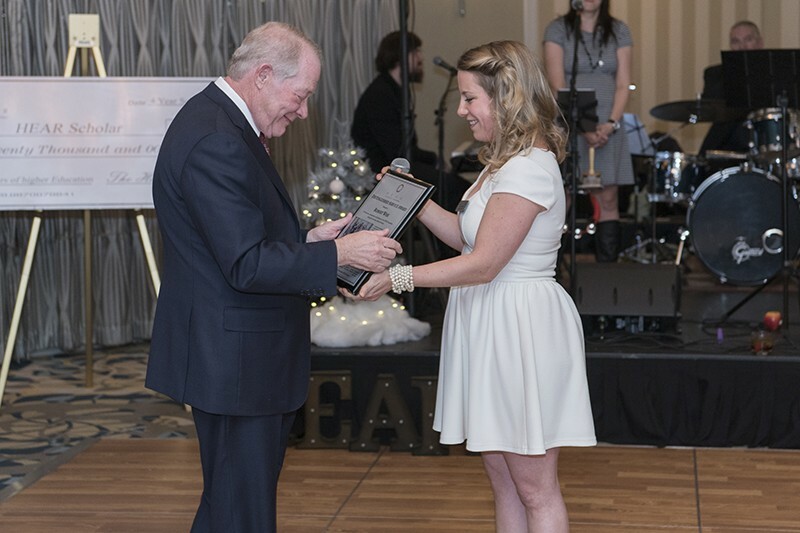 Our record breaking year ended on a high at our annual fundraiser in December. 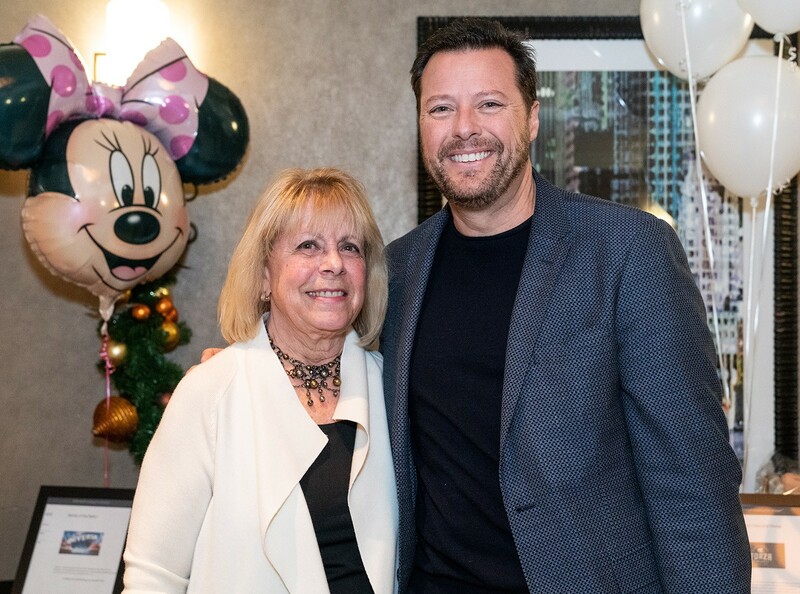 We were delighted that so many of our supporters were able to join us to celebrate the most successful year to date for the HEAR Foundation. Guests enjoyed fantastic music from our live band and danced the night away with their friends. 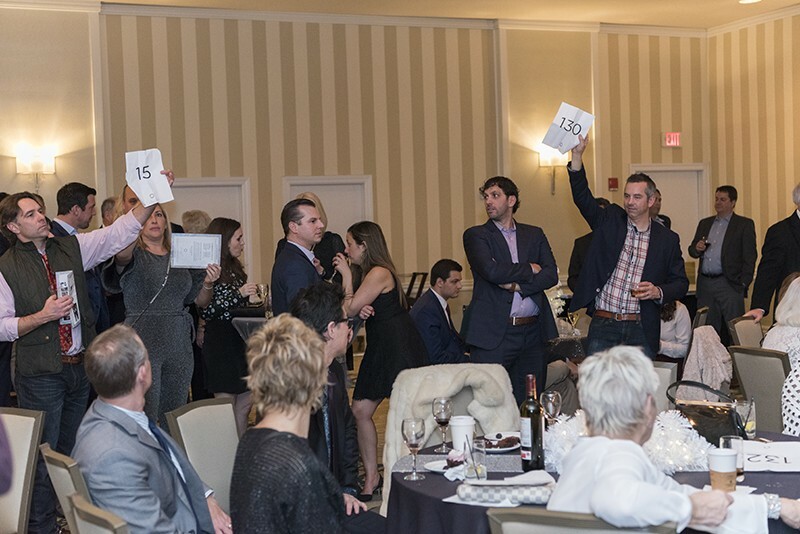 The auction items were a hit, as was our First Annual Scholarship Squares competition – congratulations to Mike O’Leary who won a beautiful diamond bracelet. Bob Wise, HEAR President, received an award for his years of service, and Kirk Kirkegaard received a Man Of The Year Award for his continued support of our Foundation. We are grateful to everyone who made 2017 such a successful year for the HEAR Foundation and we look forward to the next event! Here are a few pictures from the event……. More pictures of the evening are available here! Our 2017 Winter Scholars Social Brought Out Everyone’s Competitive Side! 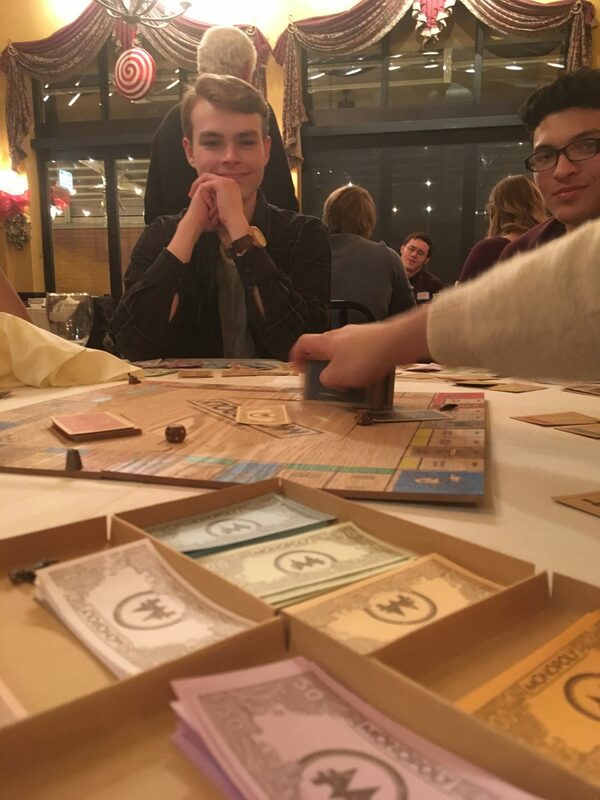 Our Winter Social focused on team building: HEAR Scholars played games together and got a chance to talk to directors, mentors, and other supporters. 2017 was an eventful year for all of our scholars, but especially for the freshmen. This break is a great chance for all to decompress and set goals for 2018. 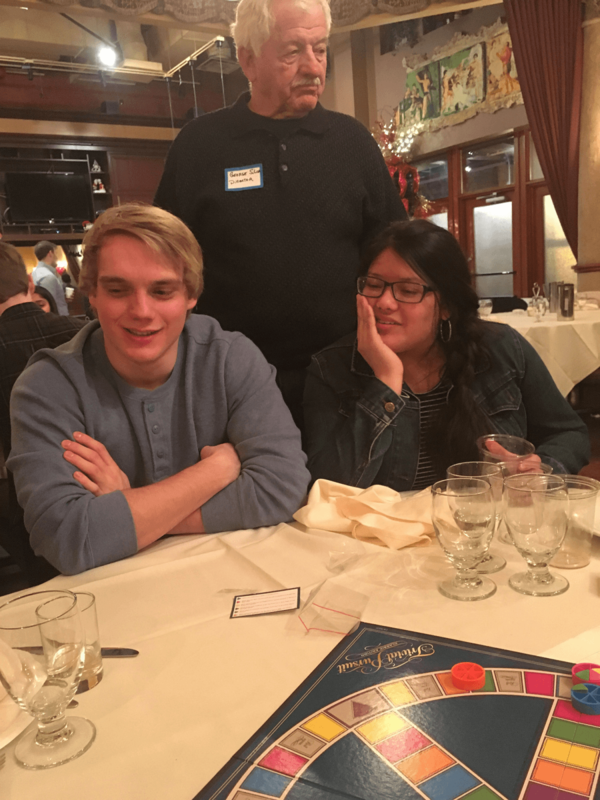 For the event we hosted Game Night at Pompei Taylor St restaurant in Chicago – because playing games together builds team spirit, fosters a sense of community, and gives our more competitive family members a chance to pit their strengths against each other.